My research interests’ center around understanding the impacts of climate change at the local scale and producing information about any potential risks that can help communities prepare for the future. Specifically, my PhD research is focused on understanding the impacts of climate change on extreme weather events for tourism destination communities around the Great Lakes region, how the vulnerability of these communities to extreme weather events is affected by socioeconomic factors, and what capacity the tourism sector in these communities has to respond to threats from extreme weather events. Another goal of my research is to produce information in a form that is compatible with tourism managers’ decision-making processes through stakeholder collaboration. It is my hope that the outcomes of this research will improve the understanding of climate change impacts, especially related to extreme weather events and the tourism sector, at the local scale and offer insights into a process of producing useful science that can be applied to other environmental issues, sectors and communities. Before coming back to school full-time to pursue my PhD, I worked for about four years in Washington, D.C., for several science and environmental policy organizations. It was through this setting that I came to more fully appreciate the importance of people who can communicate across disciplines and the many ways that science and society interact. It was my hope, in pursuing further education, that I would be able to develop the skills and expertise needed to work across disciplines on important environmental issues. I feel incredibly fortunate to be a part of the ESE program because it allows me to pursue these aspirations while conducting research that builds on my engineering and policy backgrounds. Day, J., N. Chin, S. Sydnor and K. A. Cherkauer. “Weather, Climate, and Tourism Performance: A Quantitative Analysis.” Tourism Management Perspectives 5 (January): 51–56. Chin, N., J. Day, S. Sydnor, K. A. Cherkauer (2013). Assessing the Impacts of Climate Change on Tourism-Dependent Communities in the Great Lakes. Poster presentation at the American Geophysical Union 2013 Fall Meeting; December 9-13, 2013, San Francisco, CA. J. Day, N. Chin, S. Sydnor (2013). Building Resilience to Climate Change in Great Lakes Communities: Tourism Dependent Destinations. 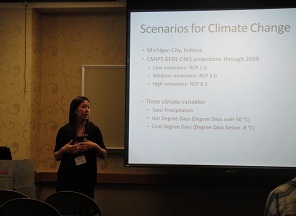 Oral presentation at the International Association for Great Lakes Research Conference; June 2-6, 2013, West Lafayette, IN. Chin, N., J. Day, S. Sydnor, K. A. Cherkauer (2012). Tourism and Climate Change: The impact of weather on tourism profitability. Oral presentation at the International Conference on Tourism, Climate Change, and Sustainability; September 13-14, 2012, Bournemouth, UK.